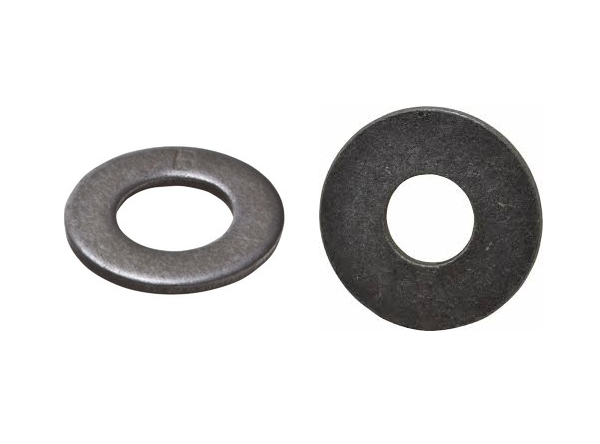 JF Engineering Products LLP manufacturer & exporter of USS & SAE Flat Washers availbale in various forms and size, products like nuts, bolts,stud bolts and washers etc.Fasteners dimensions, dimensional tolerances are defined in the ASTM A307 standards. USS & SAE Flat Washers standard covers pressure-temperature ratings, materials, dimensions, tolerances,marking, testing, and methods of designating openings for fasteners. Products are packaged to ensure that there is no damage during transit. In case of exports, standard export packaging is done in wooden cases. All pipes are marked with Grade, Lot No, Size, Degree and our trade mark. On special requests we can also, make custom marking on our products. At JF Engineering Products LLP, all fasteners are subject to strict inspection at each stage of the production process, from starting material purchasing to product dispatch. They are visually examined for conformity to ASTM, ASME, MSS, DIN, EN, and JIS codes and standards. Upon request, official certified Inspection Agencies can be called in to witness the material reports, dimensions and quality conformity of products. Orders will be sent out within 2-3 business days, and may take up to 5-10 business days in transit. If fastener is out of stock, orders may take up to 2-4 weeks to ship. JF Engineering Products LLP will notify buyer if this situation occurs..